New York - On the Eve of the Nativity of Christ, young people from the dioceses of the Russian Diaspora visited the Russian capital of Moscow, where they participated in a youth symposium dedicated to the 90th anniversary of the founding of the Russian Orthodox Church Outside of Russia. His Holiness Patriarch Kirill of Moscow and All Russia received the participants in this symposium for the first time. “We had a busy schedule, and a very interesting one,” said the Vice President of the Synodal Youth Department, Protopriest Andrei Sommer. “We came to Moscow at the invitation of the Rector of St Tikhon Orthodox Humanitarian University, Protopriest Vladimir Vorobiev, in order to participate in a symposium dedicated to the 90th anniversary of the establishment of the Russian Orthodox Church Outside of Russia. - In October of last year, a youth symposium was held on the same subject in New York. Representatives of the clergy made presentations to the youth. Did the participants of the symposium share stories about the fates of Orthodox Christianity abroad with their counterparts in Moscow? - Yes, we made a few presentations both at St Tikhon’s University and in Moscow State University. Ilya Shikaloff talked about the life of Orthodox youth in San Francisco, Suzanna MacLellan discussed life in the English-speaking parishes of the Church Abroad. Anastasia and Xenia Roudenko shared stories about the life and work of the center of the Russian diaspora, Jordanville. Alexei Eremenko talked about Orthodox life in Seattle, and Svetlana Makarova of Brisbane spoke about the life of Orthodox Christians in Australia. It is worth noting that before the symposium began, a moleben was performed before the relics of St Tikhon in Donskoy Monastery, headed by Fr Vladimir Vorobiev. It was with inner trepidation that we visited the cell of the All-Russian Patriarch-Confessor. We also visited St Sergius-Holy Trinity Lavra, where we prayed over the relics of St Sergius of Radonezh, after which we participated in a meeting with the seminarians of the Theological Academy. I was happy to see Russian bishops also participating in the commemoration of the anniversary of the Church Abroad: Bishop Ignaty celebrated Divine Liturgy at St Tikhon University, and Archbishop Justinian, the Administrator of the Patriarchal Parishes in the USA spoke at the symposia both in New York and in Moscow. - Yes, without a doubt. 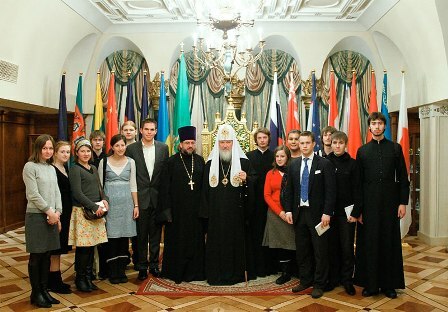 Our young people were given a remarkable opportunity to meet with His Holiness Patriarch Kirill. If during previous trips to Russia, we were able to meet the Patriarch briefly during divine services or other events, this time His Holiness Patriarch Kirill officially received our delegation. The members of our delegation prayed during Divine Liturgy in Christ the Savior Cathedral, which was celebrated by five metropolitans, five archbishops and bishops, twenty-five priests, during which we witnessed an episcopal consecration. Our youth saw how a bishop is made for the first time, and it made a great impression upon them. The church was full, our young men and women partook of the Holy Gifts, and at the end of the service, we participated in a Patriarchal reception, sitting very close to His Holiness, which was a great honor for us. When I was asked to raise a toast, I congratulated everyone on the Sunday and said that our youth came to Russia so that they would not only hear but really get to know and learn about life in their historic homeland. - Fr Andrei, what did you say during your toast? 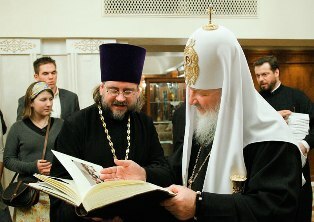 - Many years for His Holiness the Patriarch! Then we went to another room to meet with the Patriarch. We gave the Primate of our Church a large leather-bound album with photographs showing some moments from our pilgrimages and the work our youth has done in renovating holy sites in Russia and abroad. We saw right away that he was genuinely interested in the photographs and the work of our youth. As we approached to receive the Patriarch’s blessing, each of us received a Christmas present and an icon of the Nativity of Christ. We took a photograph together with His Holiness for posterity. This was a significant event for us. Our kids cherished the Patriarch’s attention, who received us despite a heavy work load. Not everyone gets to experience such memorable, blessed moments! Later that day we traveled to Butovo to show our youth the Church of the Holy New Martyrs and Confessors of Russia and Butovo Square, where many of the martyrs met their end. We served a moleben, and in the church’s crypt studied an exhibition of the personal effects of those who were tortured and executed for their faith. Our visit to this church was especially dear, for participating in the foundation of this temple and its consecration was Metropolitan Laurus of blessed memory, and the lower church of the Butovo complex is consecrated in memory of St John of Shanghai. - At the invitation of Abbess Eroteida of Nikolo-Solbinsky Convent in Yaroslavl’ Diocese, we visited her ancient monastery and witnessed a miracle: on the site of a psychiatric ward, which stood here for many years, the Abbess and sisters rebuilt a monastery from the ruins. Our friendship began in New York, which Mother Eroteida visited last fall. The orphanage at the convent is home to 14 girls, who go to school. These are mostly abandoned children, or whose parents are alcoholics or drug addicts. Under the close and caring attention of Mother Eroteida, the children warmed up, and organized a concert for us and gave us refreshments. What we saw made a great impression on our young people. One of our girls decided to return to the orphanage in the summer to spend a month living and working there. That evening we were invited to a picnic in the forest. It is difficult to express what we experienced! We traveled through the dark woods on a horse-drawn sleigh. Our young people had so many emotions, especially when, in the midst of the Russian frost, everyone immersed themselves in a holy wellspring with ice-cold water! - You certainly experienced a great deal… But hasn’t the work of the Synod Youth Department produced visible fruit from these joint trips and meetings? - Since the signing of the Act of Canonical Communion, some 100 young people have participated in various programs organized by the Synodal Youth Committee. Some wonderful Orthodox family partners have resulted—we are looking forward now to the third marriage which resulted from this. These are visible fruits of our efforts. I would like to thankfully note that these trips and resulting acquaintances in Russia would have been impossible without the help of the Fund for Assistance to the Russian Orthodox Church Outside of Russia. In the year 2010 alone, we organized five trips with the active interest and real support of the Fund for Assistance, which helped establish bonds with the young people of Russia.